Converting an existing garage or carport into a rumpus or games and party room is a cheap way to gain some additional floor space and provide some privacy for Teenage children when they entertain their friends. Planned and executed properly it will add value to your house. A double garage is especially good for this as this space is usually 6mx6m and often under the main roof. A garage is classified as a class 10a structure under the BCA and by changing its use to a habitable space its class needs to be changed to class 1. Class 1 structures have a much more stringent set of requirements than class 10a. Complying with these requirements is at times tricky and sometimes creative solutions are required. What seems a simple task requires a good deal of knowledge about planning regulations and the Building Code of Australia if a good outcome is to be achieved. On several occasions I have been brought in to re-document garage conversions that have been started without proper documentation or approval. Disputes with neighbors will often result in stop work orders issued by Local Council. Building is only allowed to re-commence after providing retrospective documentation. The remedial works required to gain compliance far exceeded what these Clients had tried to save. One common problem encountered is that the minimum allowable ceiling height for a living area is 2.4m. Often garages have less than this. Alternately they may have 2.4m but the floor level is set down to allow car access. This is a problem as living areas have minimum requirements for floor height above adjacent ground level. If the floor is raised to comply then the ceiling does not. Another problem is that there may be no white-ant treatment or damp proof membrane under existing Garage or carport slabs. The remedial work required to resolve these shortcomings may be difficult to achieve without serious structural changes. Most jobs require a new topping slab as this means complying white-ant treatment and damp proof membrane can be installed. Most Councils have planning regulations that require a minimum of 1 under-cover car-park per dwelling. If you are converting your Garage to a living space then you need another under-cover car-park elsewhere. Building a new carport in front of the existing house to provide a new under-cover park is usually not allowed as most Councils have specific planning rules prohibiting this form of development. Double or triple Garages are usually the easiest to work with as the simple solution is to put up an internal partition dividing the space so that one (complying) car-park is retained. Garages and carports are also quite often on or near boundaries. Development on a boundary is always problematic as it raises the issue of Fire-resisting construction and minimum setback rules. Each case is unique and it is advisable to gain professional advice before commencing. I can usually provide a solution to suit most clients briefs. I have found that charging at my hourly rate I can usually provide the required documentation for Development approval for around $2000. This is approximately 25 hours work. This is assuming that there is no problem with council at the planning stages and the job can be done with one comprehensive submission covering both Planning and Development Approvals. This Client had hired a draftsman and had applied for and received Planning Approval before contacting me. 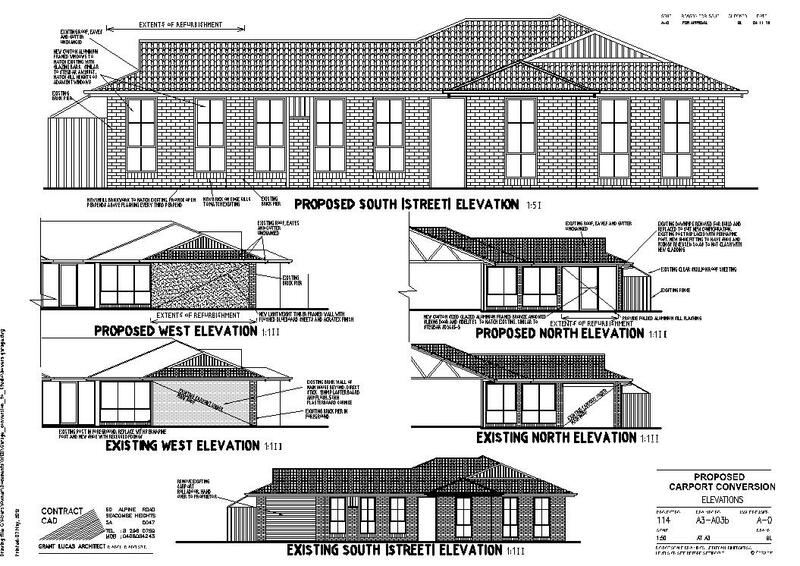 The draftsman did not have the ability to provide the necessary drawings required for the working drawings and I was engaged to finish the job and obtain Development approval. The owner had an existing undercroft which housed a 3 car Garage. The brief was to convert 2 of these car spaces into a studio space with ensuite that could double up as a guest suite if needed. The main challenge of this project was to provide complying waterproofing details without raising the existing floor level. BCA cross ventilation and energy regulations resulted in changes to the original Planning Approval proposal. Luckily these changes were not considered substantial enough by council to void the existing Approval. Small conversions such as this often require complex planning and detailing knowledge and it is a false economy to get some-one inexperienced to prepare the necessary documentation. 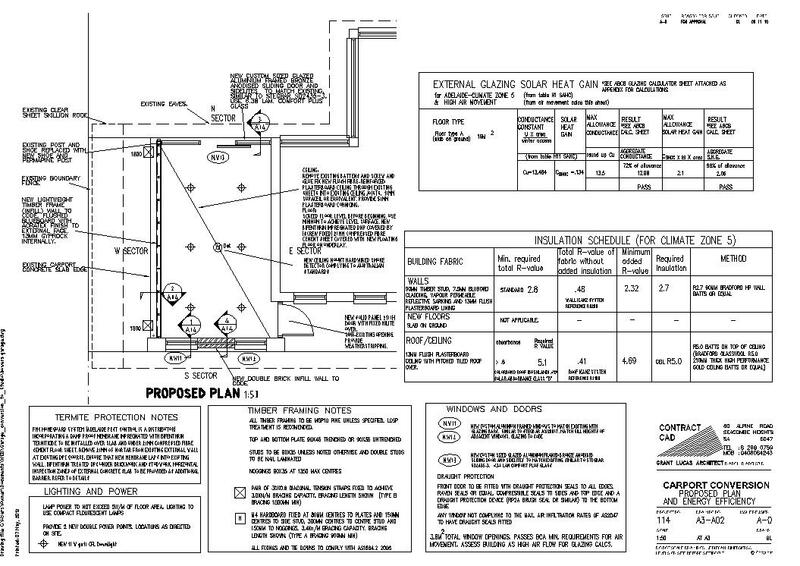 I commonly am called in at the last minute to fix documentation deficiencies in working drawings. The client invariably will end up paying more for this remedial work than if they had contracted me at the start of the project. The traditional sleep-out of the 1950's is fondly remembered by many as an Australian Icon. As families grew verandahs were infilled and additional bedrooms added. This was a cheap and quick way of providing extra living space. Unfortunately Government regulations are now very prescriptive as to what you can (and cannot) do regarding development. The Building Code of Australia is very specific about the requirements of a habitable space. The main problems to overcome in upgrading a non-habitable space into a habitable space (or a class 10a structure to a class 1 structure) are termite proofing, water proofing, height above adjacent ground level, surface drainage, minimum ceiling heights, ventilation requirements, natural sunlight adequacy, insulation and energy efficiency. Verandah floors quite often will be set down lower than the main building and roofs will be lower. This means that any, or all of these BCA requirements may be breached by simply infilling a bit of lightweight walling between the verandah posts, adding a door and providing a bed. It is best to get some Professional advice before you proceed or you may be forced to demolish or at the very least undertake very expensive remedial works to get the building certified as habitable. It is a Government requirement that a Garage, Carport, verandah, shed or other non-habitable space that you wish to convert to a habitable space such as a study, sun-room, bedroom, rumpus room or teenage-retreat be certified as complying to Australian Building Code standards. To do this you will need the correct documentation and Approvals. If you decide to go ahead & just fit the room out because you think no-one will know, you may run into trouble in the future if you wish to sell the property. If the worst happens and there is fire, water or termite damage to the building you may also find that your insurance company will not cover you. By commissioning your own drawings you will be able to shop around between builders. This is the only way you will be able to accurately compare what different builders can offer. A properly prepared set of documents will save you much more than you spend on them... Plus you are able to get exactly what you want rather than just accepting what the builder is prepared to give you.